These super-sweet organic peeled tomatoes are said to be the finest San Marzano tomatoes in the world! Organically grown in Puglia (just outside the PDO region) Paolo Petrilli tomatoes are the choice of top chefs around the world, served in Italy's finest restaurants and in London's River Cafe'. The crop comes from a limited production of 5 hectares of tomatoes a year to ensure the best possible, top quality product. 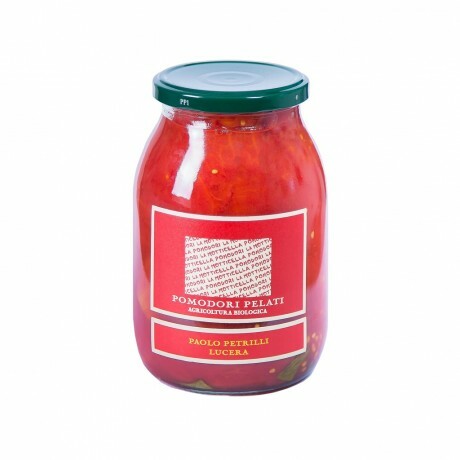 These San Marzano are hand picked, simply placed in boiling water for a few seconds, hand peeled and preserved without any preservatives or colourants in a simple glass jar with just a leaf or two of fresh basil. Full of the flavour of southern Italian sunshine, incredibly fresh, dense and sweet, these plum tomatoes make an extra special sauce for pasta or an indulgent topping for pizza!